Its common these days to hear and even experiencing it ourselves one of the most regular screw up on mobile like "i just dropped my mobile phone down the toilet." Its a painful and messy experience. Not to worry, Jon Tickle, star of Big Brother and Brainiac explains what to do the next time your phone takes a swim! Its worth a try and you may end up saving those precious information on your mobile and even saving your phone too. 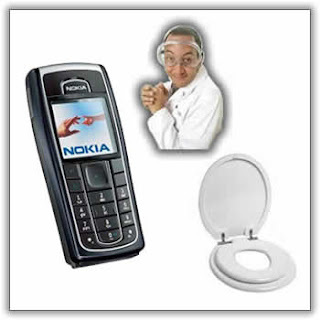 Every year, Britons drop 850,000 phones down the toilet! At a cost of over £300 million! Next time this happens to you, don’t fret, and don’t worry about the buzzing and hissing, use our simple guide to nurse your phone back to full health! Now different people swear by different methods of resurrecting a mobile phone, so were going to test three methods and see which one works best…the fridge method, the alcohol method, and the window method! And for our experiment we’re going to use three identical Nokia 6230s, and some wee! Obviously make sure you fish it out as soon as possible, you can always wash your hands later! Immediately take the battery off. Electricity and water do not mix! Many circuits inside the phone will survive immersion in water provided they are not attached to a power source when wet. Then take the sim card out! Your contacts may well be the most important part of your phone. The sim card actually survives water damage very well, so best just to take it off and leave it to dry. Now here’s a little tip, if you happen to have gone for a swim with your phone in the sea for example, but don’t do it if you have dropped the phone into clean water. Briefly immerse your phone into deionised, or distilled water. This is to clean the phone of the impurities in the water, such as the salt in the sea which is corrosive and will damage the inside of the phone. First pat the phone down with a paper towel to get off as much of the excess water as your can. Now the phone needs to properly dry out. The important thing is to be patient and to let the water dry out at an even rate. Do not stick the phone in the oven, in a microwave or under a hairdryer as excessive heat will just cause more damage to the phone. We’re going to test three different methods here, the fridge, the alcohol and the window. Now it might seem a bit silly sticking your phone in the fridge, but they say a fridge apparently acts like a dehumidfier, and will dry the phone out nice and evenly. Again, it sounds a bit daft soaking your phone with alcohol, but strong alcohol will displace water and sediments and will dry out quickly with little residue. And finally we’re going to try a slightly more sensible method, leaving the phone in a gentle flow of air, such as by a window, or that found on top of a tv, or a computer monitor for example. Now be patient! Leave it for a day, and don’t try to turn it on! Better to be without a phone for a day than to have to buy a new one. Ok, so lets test the alcohol method, put the battery back in, try and turn the phone on, and… nothing! Oh dear! Right, onto the fridge, that’s nice and cold, stick the battery in, and again, absolutely nothing. And here’s our phone by the window, stick the battery in, turn it on, and, oh yes, its working! There’s all the proof you need! The best way to recover a phone you’ve dropped down the loo, is to dry it out by an open window. How about the iphone, I immerse it in water, like washing machine. I did not realized that my phone was wrapped in my bed cover and discovered after 5 mins in the washer. Do you think it will work? Becky, I just washed the Iphone of my husband thoroughly in the washing machine (40 degrees C). Did yours survive?